This week I have re-fallen in love with my Brown Rice ‘white’ bread gluten free bread machine recipe. 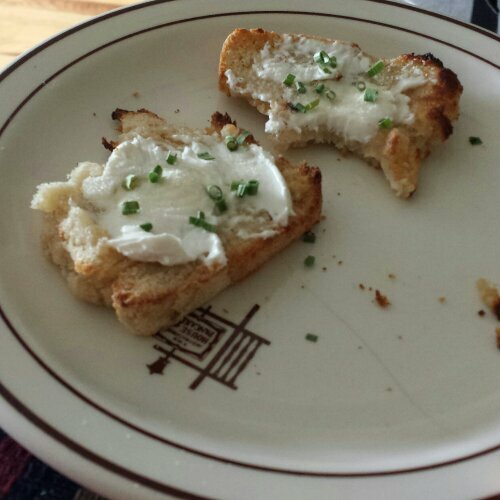 I have been enjoying it every day with Toffutti cream cheese, garlic powder and chives. When I made this bread in the past, it was dry and crumbly, and only got drier each day. 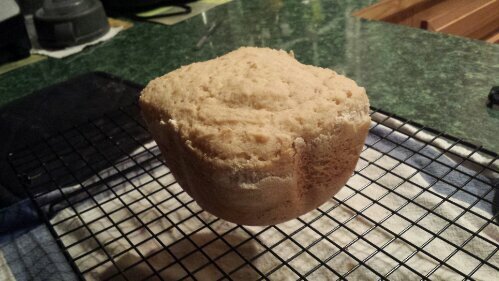 This time, I used the ‘soft’ setting on my bread machine and the loaf came out slightly under baked. Each day I have been toasting it to ‘crisp’ it up. Remove immediately when the bread is done (it has the tendency to burn if left for a long time in the bread machine). Put on cooling rack to cool completely (out of reach of the cat) before storing in an airtight container. Will keep about 4 days, or longer if stored in the fridge. Serve toasted. There are side effects from using either xanthan gum or guar gum. Do you have a recipe that does not use either of them? I Can’t wait to see the result. I will keep checking. Just to let you know – I tried the recipe without the xantham gum today and it never would form into bread – it just stayed liquid. I’m sorry!! What about using a substitute for the xanthan? Like flax, agar agar or corn starch? i cant get hold of xanthan, but would love to try this! Anyone tried with another binder? Hi! I’ve never tried it with another binder (but I can say it doesn’t work without a binder!) If I had to guess, I’d try agar agar first. It seems to be the closest substitute! I’d love to hear how it turns out! Thanks for stopping by! My family and I absolutely love your gluten free bread with the flax meal in it. 2) can I double the recipe for the bread machine? Thank you for your recipe and for your time. 2 – This recipe makes a 1 pound loaf, so if your bread machine is a 2 pound machine (or bigger), I would think that doubling everything would work just fine! I’d love to hear how it turns out if you try it! Great bread. About to make a second batch. Moist. Dense. Love it. Second batch turned out great as well. Used coconut oil instead. It’s a keeper. Wonderful!!! Coconut oil! That’s a great idea! We leave the vegan butter out completely sometimes too. I so glad you like the recipe! Pingback: Thanksgiving Stuffing/Dressing [Vegan/Gluten Free] | Make them whole foods. Make them delicious. And make sure you feel great eating them. Pingback: Traveling with Food Intolerances – Toronto | Make them whole foods. Make them delicious. And make sure you feel great eating them. I have allergy to potato and I’m in a diet to avoid corn as well. What do you think I can substitute for corn and potato starch in your recipe ? Hi Nilly! Thank you for stopping by! I often times substitute the potato starch for tapioca starch/flour, and it turns out just the same! I did have a friend once sub tapioca starch/flour for the corn starch, and it turned out well too! I’ve never tried to substitute tapioca starch/flour for both the corn starch and the potato starch, but I think it could work! I’d love to hear about it if you try it! I used the tapioca for both starches and used oat instead of rice flour. Best bread ever! This recipe looks great. I am intolerant to corn. Any thoughts on a corn starch replacer for this? Thanks. Hi, Alison! Thanks for stopping by!! Although I have never tried it myself, a few people have been successful in replacing the corn starch with potato starch (so you would do 1/4 a cup plus the other 2 tablespoons of potato starch already in the recipe). Tapioca starch would probably work well too. I’d love to hear how it turns out! Where is the link to your brown rice flour recipe. The link I tried is broken. I prefer to eat without added fats….is there something I could substitute foe the earth balance like applesauce or another ingredient so that is will still rise but be added fat free? Thanks. I love your videos. Thanks. I will try it without earth balance. Also I am not gluten sensitive. Should I still be using gluten free flour (brown rice flour) that your recipe calls for? I’m looking forward to trying this loaf. However, I cant seem to find how many eggs to put in this recipe – they’re not listed in the ingredients. I’ve just watched the video and no understand about the eggs. Hmm – that’s no good! Did it rise at all, or was it mostly flat? If it didn’t rise, it could have been the yeast. Was it bought recently? Also – does your bread maker have a white bread, or short cycle on it? I have never tried using the “gluten free” setting – so I am not sure what the differences are! Can I use tapioca flour interchangeably with potato starch? Can most bread machine recipes such as this be baked in a conventional oven?